The chances are that Steven Gerrard remembers Jamie Carragher’s Anfield farewell. It was the celebration of a great career. His long-term ally’s children joined him on the pitch and the Kop formed a mosaic that read ‘JC23’. Carragher even almost scored the rarest of goals with a ferocious shot that hit the woodwork. It was also meaningless. Not to Carragher, to his family or to the fans who paid tribute to a homegrown hero, but in a cold, hard sense. There was nothing at stake. Liverpool were not playing for a top-four finish. There were no trophies to parade on the Anfield pitch. A wonderful servant’s playing days ended in the anti-climax of an underwhelming season. Two years on, there is the risk of a repeat. Except that this time, Liverpool’s final fixture is not even at Anfield. It is at Stoke. Windy, unromantic Stoke. A 17th year of Gerrard’s extraordinary service could conclude amid tussles with Ryan Shawcross at corners. If there is nothing to play for, there must be a temptation to say goodbye to Gerrard eight days earlier, against Crystal Palace and, more importantly, at home. Gerrard put an end to speculation about his future, sparing Brendan Rodgers months of questions about a new contract (and potentially another season of debate about his place), by announcing he will leave Anfield. While it was essentially a selfless decision, one possibility is that the next four months become a farewell tour. That every game gets framed in the context of Gerrard, of whether he starts or stars or scores, of whether he can record a final Merseyside derby win, a last triumph against Manchester United, another victory against Chelsea, the club he twice rejected. There will be his last goal, his last penalty, his last assist, and perhaps, in a throwback to his glory days, his last demonstration of his Roy-of-the-Rovers-esque ability to win games single-handed. Gerrard won’t want the fuss. He will appreciate the right amount of appreciation, and from the right people. He was irritated when Rafa Benitez, in his technocratic, mechanical way, denied him praise, but nor will he want too much of it, too often, in a four-month roadshow. Whether he realises it, his place in history is secure anyway. He will want some normality – or what passes for normality when you have spent 11 years captaining Liverpool in often turbulent times – before he trades Merseyside for, in all probability, Major League Soccer. But just as Gerrard, despite the ludicrous ‘Stevie Me’ tag, is essentially a team player, one who, despite scoring 180 goals for Liverpool, will pass if a team-mate is better positioned, the rest of this campaign is about the team. A fitting farewell to him isn’t about flags, banners, songs or a commemorative programme as much as leaving with a tangible achievement. The Capital One Cup offers the most realistic chance of silverware. Gerrard famously helped Liverpool overcome Chelsea in two Champions League semi-finals. Now he has another two-legged tie against them. Perhaps the FA Cup could bring a May honour, just as it did in 2006. A player whose greatest two hours in a Liverpool shirt came in the Champions League will never play in the competition for them again. Win the Europa League and at least he will leave Liverpool with a place in the European elite. Their other route back is to finish in the top four. But after taking a mere 29 points from the first 20 league games, they probably need another 40 from the remaining 18. 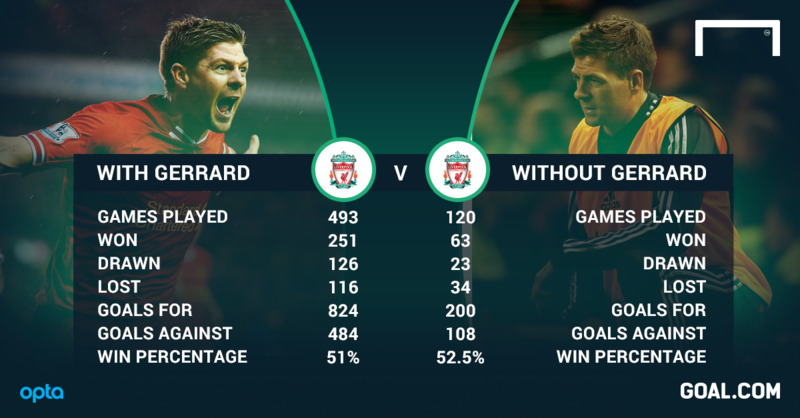 One way or another, Liverpool will have to improve markedly if Gerrard is to depart a winner. And Brendan Rodgers has decisions to make. He has overplayed his captain at times this season, exhausting him with an over-reliance on Gerrard. One of the few times he rested the 34-year-old was in the away game against Real Madrid. It was cruelly tactless. Now he has to imagine a future without Gerrard, one where Jordan Henderson, Joe Allen and Emre Can have parts to play and Lucas Leiva might. He has to prepare Liverpool for life after Gerrard. He has to balance different objectives rather better than he has done so far. He has to ensure he does not disrespect a legend. He has to win games. The 4-1 defeat of Swansea, which Gerrard watched from the bench, prompted the now familiar suggestions Liverpool are better without him. Anyone who witnessed the first hour of the games against Stoke and Sunderland where, with the captain sat on the bench, Liverpool failed to record a shot on target, has the evidence to disagree. Rodgers’ current 3-4-2-1 system suits Gerrard, getting pace either side of him and in front of him. But he cannot play every game. Rodgers has to pick and choose rather more cleverly. And at some point, he has to plan for next season, when he will need a new goalkeeper, a new centre-back, a new striker and a new Steven Gerrard. The tributes to the departing captain should not obscure the size of the task.